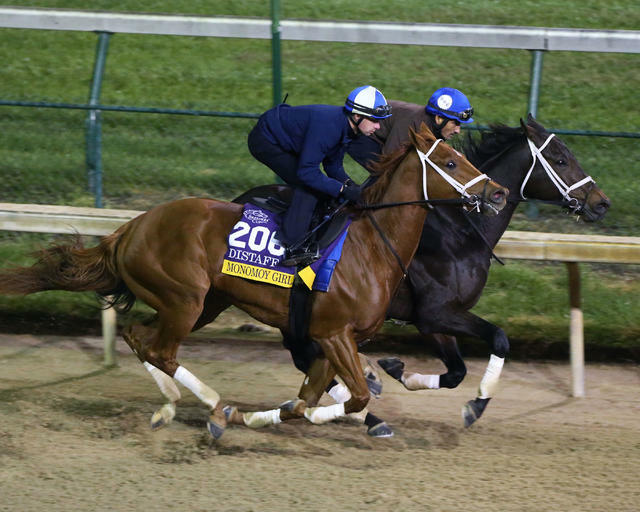 There were a total of 20 Breeders’ Cup contenders who breezed Sunday morning at Churchill Downs as the connections eagerly await the 35th renewal of the World Championships on Nov. 2-3 beneath the historic Twin Spires at Churchill Downs. CATHOLIC BOY COMPLETES FINAL PREPARATION BEFORE THE CLASSIC WITH FIVE-FURLONG BREEZE IN 1:01 – Robert LaPenta, Madaket Stables, Siena Farm and Twin Creeks Racing Stables’ Travers Stakes (Grade I) winner Catholic Boy tuned up for the $6 million Breeders’ Cup Classic (GI) with a five-furlong move in 1:01 Sunday with regular rider Javier Castellano aboard. Catholic Boy worked during the exclusive window for Breeders’ Cup horses at 7:30 a.m. (all times Eastern) through splits of :13, :24.80 and :36.80, before galloping out six furlongs in 1:13.60 and seven furlongs in 1:28.20, according to Churchill Downs Clocker John Nichols. The 3-year-old son of More Than Ready has been stabled at Churchill Downs for 10 days from his home base in New York. COX QUARTET WORK FOR BREEDERS’ CUP – It was a very busy Sunday morning for trainer Brad Cox, who worked 29 horses, including likely Longines Breeders’ Cup Distaff favorite Monomoy Girl and three other Breeders’ Cup contenders. Kentucky Oaks (GI) winner Monomoy Girl came out with her stablemates Arklow (Longines Turf) and Will Call (Turf Sprint) at the special 7:30 a.m. time for Breeders’ Cup runners and worked a half mile in 48.40 in company with older male allowance level runner Dazzling Gem under regular rider Florent Geroux. Her splits were :12.20, :23.60 and :36.20 before galloping out in 1:01.40 and 1:15.80. Will Call was the first of the trio to break off into his work and was caught in :49.40 for the half mile. His splits were :13, 25 and :37.20 before galloping out in 1:02.40. Arklow, who is coming off a second-place finish in the Sycamore Stakes (GIII) at Keeneland Oct. 18, went an easy half mile in :49.60 with splits of :25 and :37.20 before galloping out five furlongs in 1:02.80. Getting a jump start on the morning was Filly & Mare Sprint entry Golden Mischief, who came out at 5:15 a.m. and worked a bullet half mile in 47. It was the fastest of the 113 half-mile works Sunday. Her splits were :13, :24.60 and :35.80 before galloping out in :59.40 and in 1:13.60. IMPERIAL HINT BREEZES HALF-MILE IN :48.80 WITH UNEXPECTED COMPANY – Raymond Mamone’s multiple Grade I-winning sprinter Imperial Hint received some rather unexpected company when he worked a half-mile in :48.80 Sunday at Churchill Downs in preparation for the TwinSpires Breeders’ Cup Sprint (GI). Imperial Hint began his half-mile breeze at the three-furlong pole. Meanwhile, Hall of Fame trainer Bill Mott’s Breeders’ Cup Juvenile (GI) contender Topper T began his half-mile breeze approximately 10 seconds earlier from the half-mile pole. Imperial Hint, a 5-year-old Florida-bred son of Imperialism, began his work with fractions of :12.40 and :36.20, before galloping out five furlongs in 1:01. PROMISES FULFILED, SEVEN TRUMPETS RECORD FINAL WORK BEFORE BREEDERS’ CUP – Churchill Downs all-time leading trainer Dale Romans could not have been more pleased following TwinSpires Breeders’ Cup Sprint (GI) contender Promises Fulfilled’s half-mile move in :48.40 and Seven Trumpets’ five-furlong work in 1:01.40 in preparation for the Dirt Mile (GI). Bob Baron’s Promises Fulfilled, with regular exercise rider Faustino Herrarte aboard, worked through splits of :12.20 and :23.60, before galloping out six furlongs in 1:14.20, according to Nichols. Immediately following Promises Fulfilled’s work, Romans’ life partner and exercise rider Tammy Fox was aboard West Point Thoroughbreds’ Seven Trumpets who clipped opening splits of :23.60 and :48.60, before galloping out six furlongs in 1:15.20. Romans also reported that Dirt Mile contender Dak Attack, who breezed five furlongs in 1:00, is “on the fence” about running in the race. CHANNEL MAKER, TOPPER T WORK TOWARDS BREEDERS’ CUP STARTS FOR HALL OF FAME TRAINER MOTT – Two of Hall of Fame trainer and former Churchill Downs all-time leading conditioner Bill Mott’s Breeders’ Cup hopes, Longines Turf (GI) contender Channel Maker and Sentient Jet Juvenile hopeful Topper T completed their final step before starts in the World Championships with separate half-mile moves in :49 and :47.60, respectively. McCarthy also reported Breeders’ Cup Classic competitor Yoshida (JPN) is tentatively scheduled to work Monday. Topper T, a 2-year-old Iowa-bred, worked at 7:30 a.m. through opening fractions of :12.20 and :24.20, before galloping out five furlongs in 1:01. Channel Maker, the Joe Hirsch Turf Classic (GI) winner, worked through opening fractions of :12.40 and :24.60, before galloping out five furlongs in 1:03.40. CASTELLANO GETS TEST DRIVE ON CITY OF LIGHT FOR BREEDERS’ CUP DIRT MILE – Mr. and Mrs. William K. Warren Jr.’s two-time Grade I winner City of Light had a get-acquainted session with jockey Javier Castellano Sunday morning, working a half-mile in :47.60 after the second renovation break. In posting the third fastest of 113 works at the distance, City of Light produced fractions of :24, :47.60 and out five furlongs in 1:00.80. “This was my first time on him and I liked him,” said Castellano before flying back to New York with a return to Louisville slated for Thursday. Trainer Michael McCarthy was happy with the breeze over a fast track. “I was pleased with him and he ran through his gears,” McCarthy said. Castellano’s work with McCarthy was not done for the morning as a half-hour later he partnered Ciaglia Racing and Eclipse Thoroughbred Partners’ Paved through a five-furlong turf work with Madaket Stables’ Liam the Charmer in 1:05.60 over a turf course rated as good. With Liam the Charmer (Breeders’ Cup Turf-G1) on the inside under Aaron Gryder, the duo produced fractions of :13.20, :40.40 and out six furlongs in 1:21. MOM’S ON STRIKE WORKS IN COMPANY FOR BREEDERS’ CUP FILLY & MARE TURF – Brad Grady and Carl R. Moore Management’s Mom’s On Strike, working in company with Calumet Farm’s Tracksmith, covered a half-mile on the dirt in :48.20 with trainer Joe Sharp aboard in her final prep for Saturday’s $2 million Maker’s Mark Breeders’ Cup Filly & Mare Turf (GI). Mom’s On Strike started a couple of lengths behind Tracksmith with Adam Beschizza up and finished on even terms with splits of :24.20, :36.20 and out five furlongs in 1:01.80. Winner of the Bewitch (GIII) this spring at Keeneland going 1 ½ miles, Mom’s On Strike may have an equipment change for the Filly & Mare Turf at 1 3/8 miles. Sharp said that Tracksmith, who is far down on the preference list for the $1 million Breeders’ Cup Juvenile Turf (GI), has been nominated to the $100,000 Atlantic Beach to be run at six furlongs on the grass at Aqueduct Nov. 10. ADDITIONAL BREEDERS’ CUP NEWS AND NOTES – Trainer Jeff Bonde’s two Breeders’ Cup hopefuls: Miss Sunset (Filly & Mare Sprint) and King of Speed (Juvenile Turf) put in half-mile works on the fast main track. Working solo under exercise rider Tony Gutierrez, Miss Sunset covered the distance in :49.80 with fractions of :12.60, :24.40 and out five furlongs in 1:04.40. Fourth as the favorite in the Thoroughbred Club of America (GII) at Keeneland in her most recent start, Miss Sunset is owned by Phil Lebherz and Alan Klein. King of Speed, owned by Del Secco DCS, Inc., covered the half-mile in :50 with splits of :12.60, :24.80 and out five-eighths in 1:04.80. King of Speed has won the Del Mar Juvenile Turf and Zuma Beach in has past two starts at the Juvenile Turf distance of one mile. Bonde is expected to arrive in Louisville from his Southern California base midweek. … The arrivals of the California-based Breeders’ Cup contenders are expected to arrive Sunday and Tuesday, according to Director of the Stable area Steve Hargrave. … Trainer Aidan O’Brien’s Breeders’ Cup contingent is on scheduled to arrive at Churchill Downs from Ireland on Monday afternoon, according to Hargrave. BREEDERS’ CUP POST-POSITION DRAW IS MONDAY – The 2018 Rood & Riddle Breeders’ Cup Post-Position Draw will be held Monday at 4 p.m. ET at the Kentucky International Convention Center in downtown Louisville on the Equestricon Main Stage. The draw – hosted by NBC’s Laffit Pincay III, Nick Luck and Breeders’ Cup Players’ Show’s Gabby Gaudet – will be streamed on the Breeders’ Cup official website www.BreedersCup.com, mobile app, Facebook page and YouTube channel. Entries for all races on Friday and Saturday are due Monday at 10 a.m. Churchill Downs racing officials will publish an early overnight of undercard entries on Monday afternoon prior to the Breeders’ Cup Post-Position Draw. Sunday, Oct. 28: First race at 1 p.m. (gates 11:30 a.m.); last of 11 races at 6:06 p.m.
oRace 8 ($100,000 Rags to Riches Overnight Stakes) at 4:36 p.m.
oRace 10 ($300,000 Spendthrift Juvenile Stallion Stakes) at 5:36 p.m.
Wednesday, Oct. 31: First race at 1 p.m. (gates 11:30 a.m.); last of 10 races at 5:36 p.m.
Thursday, Nov. 1: First race at 1 p.m. (gates 11:30 a.m.); last of 10 races at 5:36 p.m.
oRace 9 ($100,000 Bet On Sunshine Overnight Stakes) at 5:06 p.m.
Friday, Nov. 2: First race at 12:55 p.m. (gates 10 a.m.); first Breeders’ Cup race at 3:21 p.m.; last of 10 races at 6:43 p.m.
oRace 1 at 12:55 p.m.
oRace 2 at 1:28 p.m.
oRace 3 at 2:02 p.m.
oRace 4 ($100,000 Street Sense) at 2:36 p.m.
oRace 5 ($1 million Breeders’ Cup Juvenile Turf Sprint) at 3:21 p.m.
oRace 6 (Grade I, $1 million Breeders’ Cup Juvenile Fillies Turf) at 4 p.m.
oRace 7 (Grade I, $2 million Tito’s Handmade Vodka Breeders’ Cup Juvenile Fillies) at 4:40 p.m.
oRace 8 (Grade I, $1 million Breeders’ Cup Juvenile Turf) at 5:22 p.m.
oRace 9 (Grade I, $2 million Sentient Jet Breeders’ Cup Juvenile) at 6:05 p.m.
oRace 10 (Grade II, $200,000 Marathon Presented by TAA) at 6:43 p.m.
Saturday, Nov. 3: First race at 10:45 a.m. (gates 8 a.m.); first Breeders’ Cup race at 12 p.m.; last of 12 races at 6:22 p.m.
oRace 1 at 10:45 a.m.
oRace 2 ($200,000 Cherokee Run) at 11:15 a.m.
oRace 3 (Grade I, $1 million Breeders’ Cup Filly & Mare Sprint) at 12 p.m.
oRace 4 (Grade I, $1 million Breeders’ Cup Turf Sprint) at 12:38 p.m.
oRace 5 (Grade I, $1 million Breeders’ Cup Dirt Mile) at 1:16 p.m.
oRace 6 (Grade I, $2 million Maker’s Mark Breeders’ Cup Filly & Mare Turf) at 2:04 p.m.
oRace 7 (Grade I, $2 million TwinSpires Breeders’ Cup Sprint) at 2:46 p.m.
oRace 8 (Grade I, $2 million Breeders’ Cup Mile) at 3:36 p.m.
oRace 9 (Grade I, $2 million Longines Breeders’ Cup Distaff) at 4:16 p.m.
oRace 10 (Grade I, $4 million Longines Breeders’ Cup Turf) at 4:56 p.m.
oRace 11 (Grade I, $6 million Breeders’ Cup Classic) at 5:44 p.m.
oRace 12 (Grade II, $200,000 Chilukki) at 6:22 p.m.
Sunday, Nov. 4: First race at 1 p.m. (gates 11:30 a.m.); last of 10 races at 5:36 p.m.
BREEDERS’ CUP MEDIA DAY IS WEDNESDAY – Media Day for the 35th Breeders’ Cup World Championships at Churchill Downs is Wednesday, Oct. 31 from 10:30-11:30 a.m. The event will take place in The Loft at Aristides Lounge on the second floor of the Clubhouse (take stairs on second floor Clubhouse to access The Loft at Aristides Lounge). Access will be granted to the event with a Breeders’ Cup media credential. Enter the facility through the Paddock Gate. Free parking is available in the Orange or Green lots. WORKOUTS STREAMED LIVE ON BREAKFAST AT BREEDERS’ CUP – Presented by the Breeders’ Cup Players’ Show, Breakfast at Breeders’ Cup is streamed on Breeders’ Cup’s official website www.BreedersCup.com, mobile app and Facebook page each day from 7-10 a.m. ET through Thursday. The action-packed program will offer an inside look at how Breeders’ Cup entrants train and prepare for the championship races and will feature interviews with the sport’s most prominent trainers, owners, jockeys and personalities. Airing live from Churchill Downs, the show is hosted by Caton Bredar, Joe Kristufek, Gabby Gaudet and Brandon Stauble. Sunday: A 30% chance of showers, mainly before 1 p.m. Partly sunny, with a high near 68. South wind 11 to 20 mph becoming west in the afternoon. Winds could gust as high as 28 mph. Sunday Night: Partly cloudy, with a low around 45. West wind 10 to 16 mph. Monday: Sunny, with a high near 61. West wind around 7 mph. Monday Night: Mostly clear, with a low around 43. Light south wind. Tuesday: Mostly sunny, with a high near 70. South wind 5 to 11 mph. Tuesday Night: A 40% chance of showers after 2 a.m. Mostly cloudy, with a low around 61. Wednesday: Showers likely, then showers and possibly a thunderstorm after 2 p.m. High near 69. Chance of precipitation is 90 %. Wednesday Night: Showers and possibly a thunderstorm. Low around 51. Chance of precipitation is 90%. Thursday: Showers likely, mainly before 2 p.m. Cloudy, with a high near 57. Chance of precipitation is 70%. Thursday Night: A 50% chance of showers. Mostly cloudy, with a low around 41. Breeders’ Cup Friday: A 20% chance of showers. Partly sunny, with a high near 54. Friday Night: A 40% chance of showers. Mostly cloudy, with a low around 38. Breeders’ Cup Saturday: A 20% chance of showers. Partly sunny, with a high near 54. CHURCHILL DOWNS TO AIR ON TVG THROUGHOUT FALL MEET – Racing from Churchill Downs will air on TVG’s primary broadcast channel throughout the 21-day Fall Meet. Included in the coverage is onsite reports from correspondents Caton Bredar and Gabby Gaudet. TVG is available in more than 40 million homes.